Although the client was offering a commendable selection of applications and digital services to their customer, these apps were spread across mutliple platforms, databases and authentication systems, without consistent branding. Our team’s mission: To unify the user experience of all products, giving users a single location to access daily for all of their digital services. The intention was to achieve ease of access, but more importantly to bring all of a user’s data together to offer a holistic picture of their practice, something they had never been given access to before. 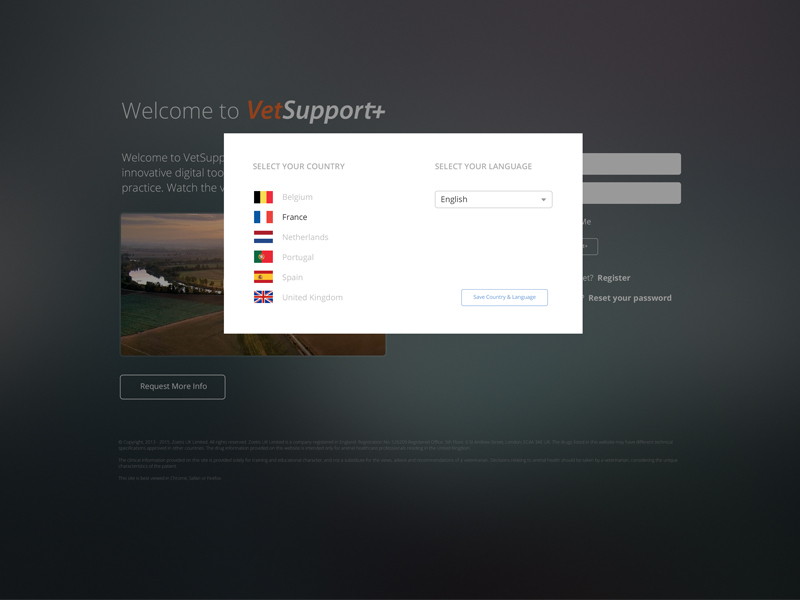 Vet customers are busy, and rarely have the time or desire to learn new technologies or applications. Our solutions need to be extremely easy to adapt for this audience, and valuable enough to earn a piece of their limited attention span for technology. Nurses tend to be more comfortable with technology, but may not need (or be allowed) access to all of the detailed clinical information that these digital services had to offer. Internal Sales Managers need access to a particular clinic’s information before, during and after a sales call. They also benefit from knowing benchmarks for surrounding areas, and clinic specialties. What are the most popular features in our current applications? What features do we feel the customer misunderstands? Where do they spend time online when they’re not in one of our applications? What do they love about digital? What scares them? During the research phase, we held multiple discussion and focus groups with veterinary professionals, sales managers, pet owners and farmers. We spent time on-site as well as in our offices, finding out how they already use technology, and more importantly what prevents them from being fast adapters to new digital offerings. Very few competitors had yet come into the digital space in any deeply meaningful way, especially when it came to collecting and analyzing data. We performed competitive analysis on other digital offerings in the veterinary and paharmaceutical spaces. Because this client was originally part of a major human health corporation, we were able to branch out our research, taking learnings from the human health space. Working with each stakeholder across various scoping sessions, features were brainstormed and prioritized, then condensed into a full wireframe workbook which was given for signoff before the final design phase. This included detailed user flows and served as a jumping off point for technical spec. The client’s corporate branding department had strict guidelines that needed to be followed for marketing websites, which were adapted to align with the unique requirements for digital products. For authenticated users, a trailer video is offered for each application within the gateway. I managed this portion of the project entirely, from writing scripts, selecting footage and music, selecting and directing voiceover talent, as well as doing all video editing using Adobe After Effects. Before development work began, I produced full HTML/CSS/JQuery templates for most screens, to ensure alignment between my designs and the final code. This also allowed us to have a hyper-functional static prototype to use to generate buzz around the project internally before launch. Through the development process I attended meetings and stayed intensely involved to ensure that UI/brand guidelines were followed and various responsive use cases were properly tested.